A rare conjunction of planets and I was actually able to get a game in over the past weekend! 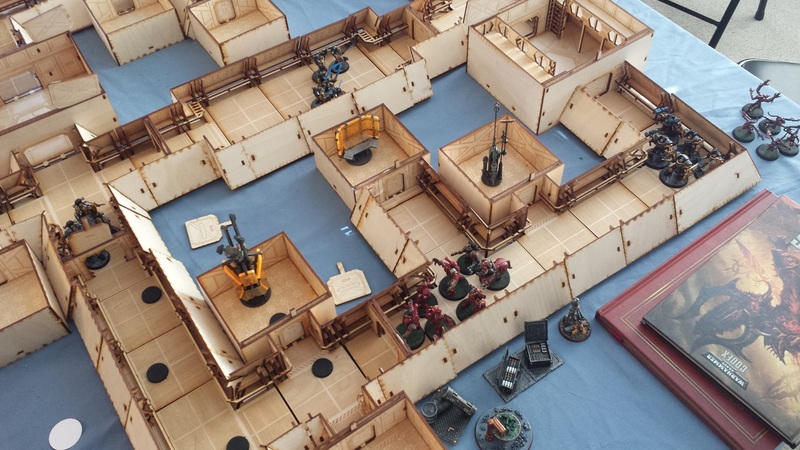 A heresy-lovin' friend of mine has been participating in the Death of Patersworld global campaign being hosted by the lovely folks over at AUS30k and invited me to take part via a game of Zone Mortalis. I readily agreed and dug out the lovely Bug Hunt Corridors I'd picked up from a Kickstarter run by Fantasy Arc, which has sadly sat unused in the Closet of Doom since I assembled it almost three years ago. Well overdue to get some use! I experimented with a few configurations and settled on a reasonably symmetrical layout, just to keep things fair. 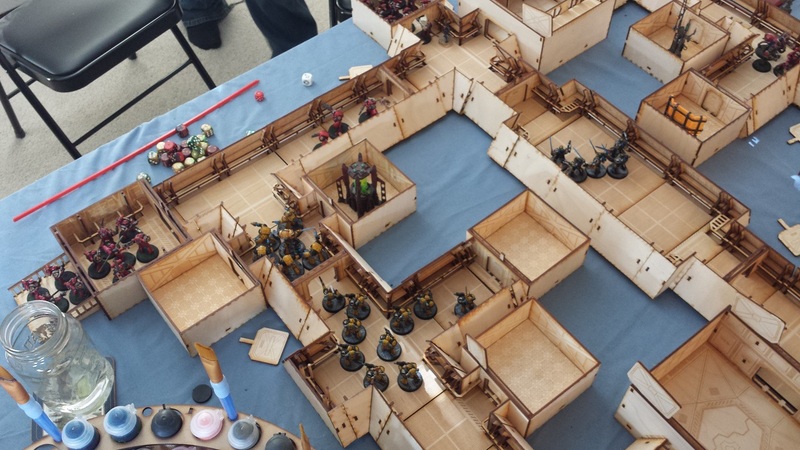 I was playing a force drawn from the Imperial Fists I'll be taking to Adepticon, while my opponent brought his oh-so-heretical Word Bearers. He had strength of numbers and overwhelming psychic superiority, but the doughty warriors of the Imperial Fists would know no fear! Things started to go sideways for our boys in yellow almost immediately. 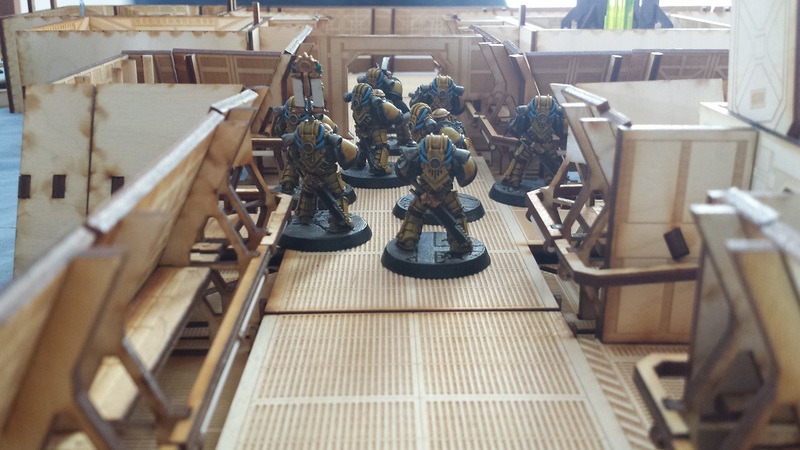 As the defenders of the facility, the foul Word Bearers had control over the security systems meaning the Fists were forced to cut open each locked door, only to find their duplicitous brethren had also mined the corridors! The sorcerers called down units of pink horrors to assault the loyalist lines, but each time the warp filth were cut down by the blades of the Templar Brethren. I was really impressed with their capability on the table - the combat squad of five cut the 10-man units of horrors down in a single turn, two turns running (the foul sorcerers having resummoned them)! On the right flank, the Gal Vorbak lay in wait for the Fists, though they were slightly stymied by their own booby traps. Just goes to show what cowards that the Traitors truly are! Going up the middle, the Templar Brethren are equally stymied by the fact that they don't carry any equipment capable of cutting through the bulkhead in front of them. Setback! With a crackle of ozone and a swirl of displaced air, a unit of Terminators coalesces in a teleport beam, landing with pinpoint accuracy thanks to the tactical squad's communications. Crisp and precise, and would make Rogal Dorn proud. With practiced ease, the terminators' plasma fire slew a pair of the traitorous Word Bearer terminators before they knew what was happening. On the left flank the Imperial Fists strategem was revealed, with a second unit of Terminators coalescing behind the Gal Vorbak in a textbook ambush. Nearby shelling caused a stifling dust to pour through the facility, confusing target locks and reducing ranged weapons fire a near impossibility. Suddenly, disaster! In the raging battle outside, a wayward macrocannon shell fell upon the facility causing a massive structural collapse! Thousands of tons of rubble rained down burying loyalist and traitor alike, with a bare handful of the courageous Imperial Fists surviving the destruction. 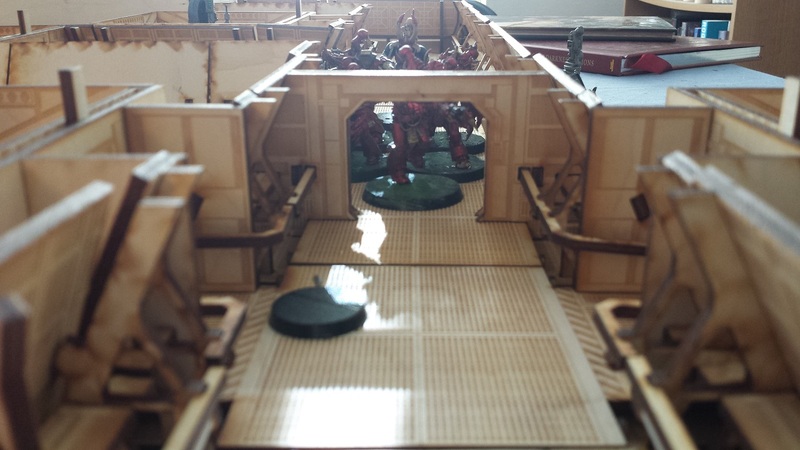 The fickle Ruinous Powers withdrew their protection from the Word Bearers who were also ravaged in the collapse, but sadly the spine of the Loyalist assault on the facility was broken. Undeterred, the survivors gathered themselves and launched a final attack. The brave warriors of the fists were never heard from again, though it is assumed they died valiantly fighting. The game was a blast, though the Fists failed to accomplish their objectives in the time allotted (dice roll ended the game at turn 5). 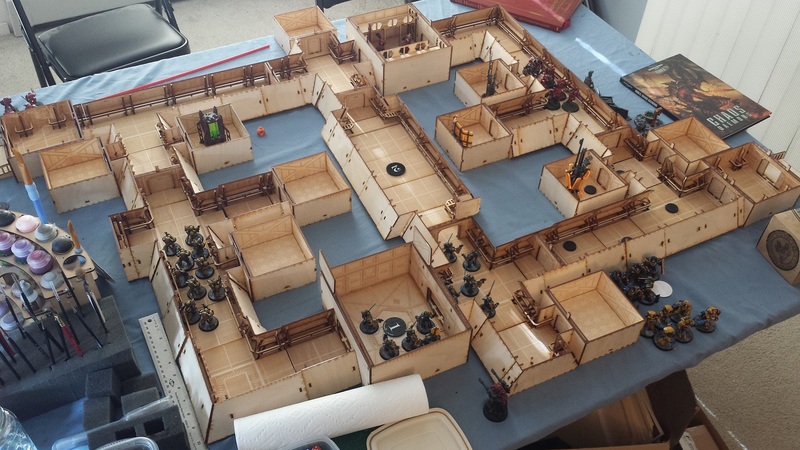 At the end we both joked that the most dangerous opponent was the terrain itself, and awarded the collapsing facility 2nd place by virtue of kill points! Next up, a bit more build time, but not what you might expect! Looked like a blast! 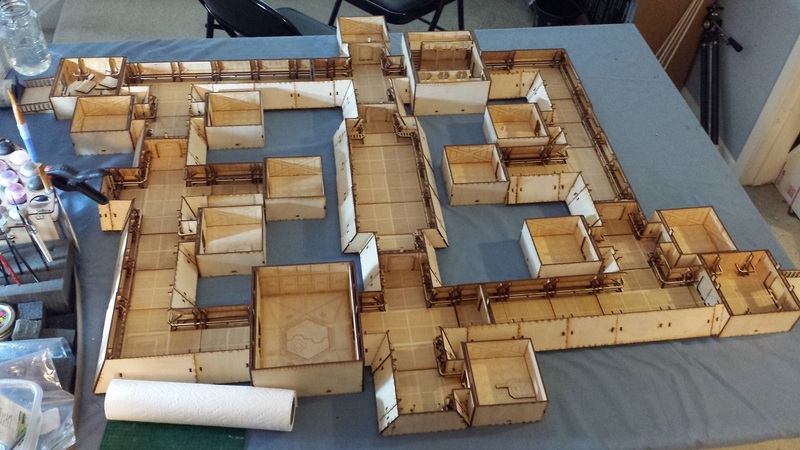 Great stuff, so will the Bug Hunt terrain now see spray paint? Nice game! And some awesome looking terrain! Do you know if it's still available? 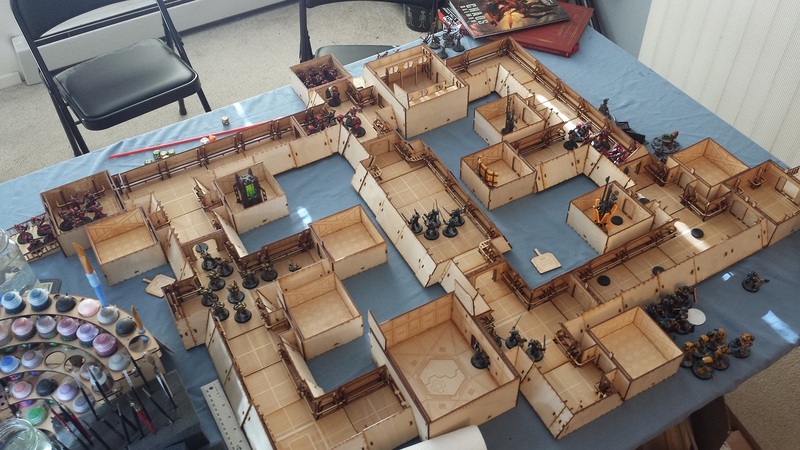 Zone mortalis is one of the reasons I am actually doing up HH stuff. Those corridors look ace as well, nice and roomy. Glad you enjoyed the game anyway. @Siph_Horridus: Indeed, good times were had by all! I'm actually turning the corridors over to a friend to paint for use at NOVA later this year! @NafNaf: Was my first time playing ZM and I really enjoyed it, would love to see your take on the terrain for sure! 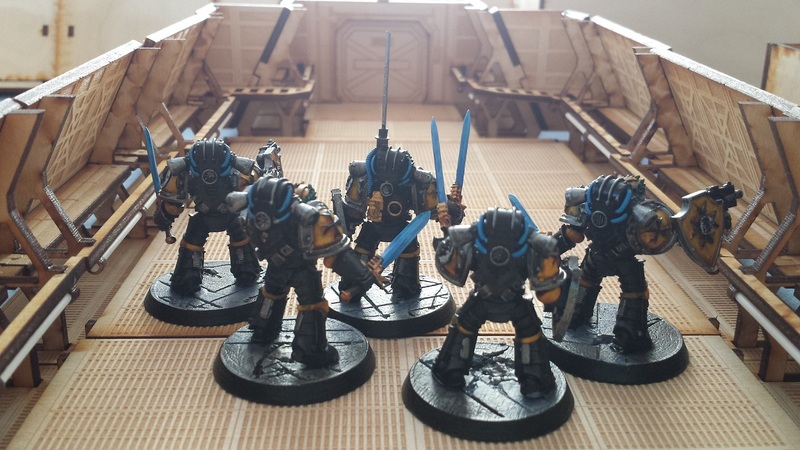 @Rory Priest: It's a great way to get into the Heresy, with the small point sizes and thematic games. Definitely going to do more in the future! I'd love to play on a 'board' like that! Awesome man .. I've been thinking of making something like that. I just haven't had the time! .. but seeing it really makes me want to move that up the list! Awesome stuff. 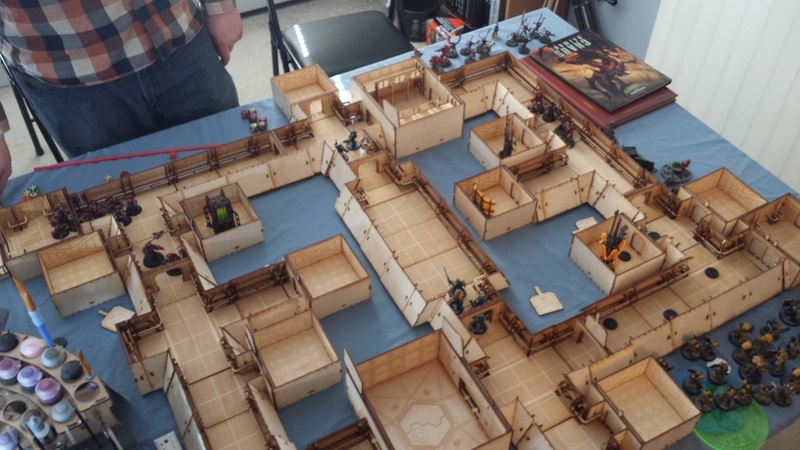 Makes me want to dig out my own Zone Mortalis board now! Wonderful batrep! It's a shame about that macro-cannon random event, but still, your boys made a good showing of themselves. @Da Masta Cheef: 'Twas rather fun! Looking forward to more ZM, for sure! @Todd Sherman: I will admit I didn't really enjoy the building of the set, it was definitely a slog. Nothing against the quality of the kit, which was beautifully designed and the instructions were top notch! @Michael Corr: It was a great time! @#2501: Haha! It was literally the worst possible effect on the chart, but it was so fitting for the narrative that it actually was welcomed! That was fun to follow! You really need to paint up that terrain, it looks bloody good.